Cleaning the air filter is another maintenance task that needs to be done to keep your engine running smoothly. It should be cleaned every week and changed monthly – regardless of how dirty it is. If this is overlooked, it will become prone to clogging which will in turn cause a loss of power and reduce the life of your engine. 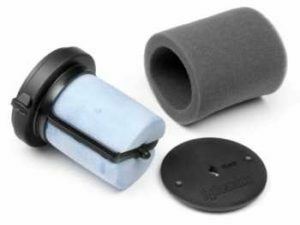 When it comes to cleaning a foam filter, most manufactures recommend using soapy water. Alternatively, a mixture of kerosene (3 parts) and engine oil (1 part) can be used. After cleaning, rinse the filter thoroughly, squeeze out excess water and blot dry with paper towel (or a clean dry rag). Once dry, work a small amount of engine oil into the filter and blot away the excess. 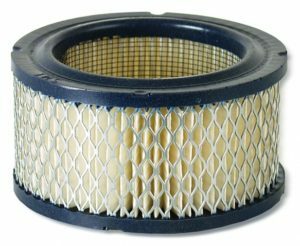 For cleaning a paper filter, first remove it from the engine and tap it on a hard surface to knock off any dirt (don’t use compressed air as this may cause the paper to tear). Whilst many manufactures recommend replacing paper filters every 50 hours, if your engine is working in dusty environments it is good practice to change them more frequently. If you aren’t sure of the correct cleaning method, it is recommended that you consult the owners manual. If the filter still appears to be dirty/clogged after cleaning, it should be replaced. Remember, checking the filter regularly will ensure that replacement is done when it is actually needed.